Rafael Guastavino constructs a tile dome for the Crossing. Intended to serve as a temporary roof, the dome still stands, one of the largest free-standing domes in the world. Diocesan House (originally St. Faith's House) completed after a design by Heins & LaFarge. Ernest Skinner begins building the Great Organ, a landmark in the history of the instrument. Among its many innovations is a primitive computer. Consecration of the Chapel of St. Columba, designed by Heins & LaFarge. William Mercer Grosvenor is named the Cathedral's first Dean. The Great Choir and Crossing are consecrated on April 19. 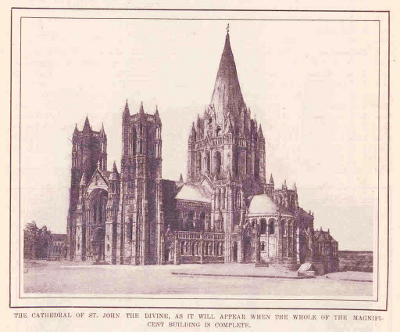 Several weeks later, the Cathedral Trustees hire a new architect to complete the Cathedral, Ralph Adams Cram. Completion of Synod House, Cathedral House and the adjacent Ogilvie House, all designed by Ralph Adams Cram. The Cathedral School building is completed after a design by Walter Cook and Winthrop Welch. Consecration of the Chapel of St. Ambrose, designed by John CarrÃ¨re and Thomas Hastings. Consecrations of the Chapels of St. James and St. Boniface, both designed by Henry Vaughn. Work begins on the foundation for the nave but is suspended due to a shortage of funds. Howard Chandler Robbins is named Dean. Consecrations of the Chapel of St. Ansgar, designed by Henry Vaughn, and the Chapel of St. Martin, designed by Ralph Adams Cram. Bishop Burch dies and is succeeded by William Thomas Manning, 10th Bishop of New York. Bishop Manning applies himself tenaciously and ingeniously to the reactivation of the building and fund-raising campaigns. The remains of Bishop Horatio Potter are translated to the Founder's Tomb behind the High Altar.